One of the best practices often overlooked by many “I’m spinning too many plates on long skinny poles” nonprofits is calendaring out the messaging your organization is going to send ahead of time. Akin to flossing, calendaring your messaging ahead of time is something that organizations think that they should do but don’t see the benefit on a day-to-day level to actually start doing it. Why is it a “best practice”, you ask? Well, let’s take a sec and check out some of the benefits! keep a consistent presence in your contacts’ inboxes (you don’t want to appear once a year). A new law is on the ballot and it’s horrible! Sign our petition! Look at all these signatures we’ve received! Help us email our lawmakers! The vote is tomorrow! Come and show your opposition! We won! The law didn’t pass! Help us continue this important work by donating! Consequently, calendaring your messaging, especially as an organization with multiple people, gives your online communications a structure and (God-forbid) a process in which to have believable, effective messaging as you use email (or whatever other tool) for your organization’s work to save the world. A Template for Calendaring Your Messaging? Well, here’s the issue. Traditional calendars in their monthly display aren’t the best for tracking any of the things in my unordered list up there. Emails and communications efforts are thrown into disparate days without any way to examine them in a systematic way. As a result, I’ve been trying to put together a simple, DIY template that anyone can use to track their messaging across time. Let’s check it out, shall we? Below is the basic component of my messaging calendar template. Across the top, going horizontal, is simply the continuous listing of upcoming months. 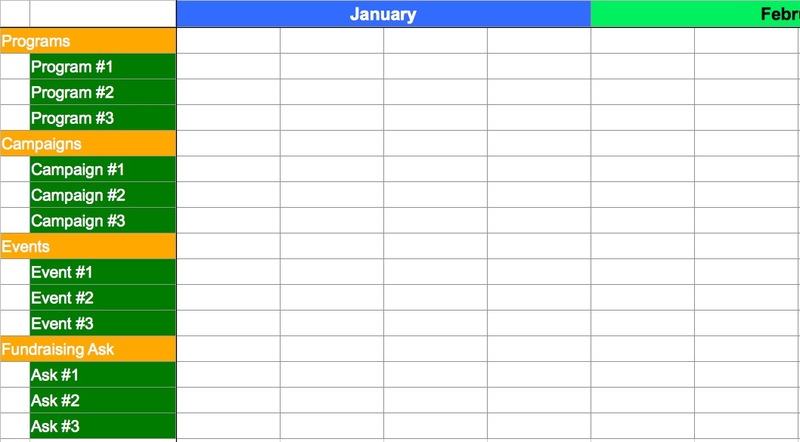 I gave each month four columns corresponding to four weeks (thinking that at our organization the most we will send in terms of emails is one per week and even that is heavy for us). Underneath the running months is an “Important Dates” line where you can mark out important campaign, fundraising and programmatic dates through-out the year as check points and touchstones from which to build out message arcs. On the left side of the template are different rows that correspond to different areas of our email blast template. 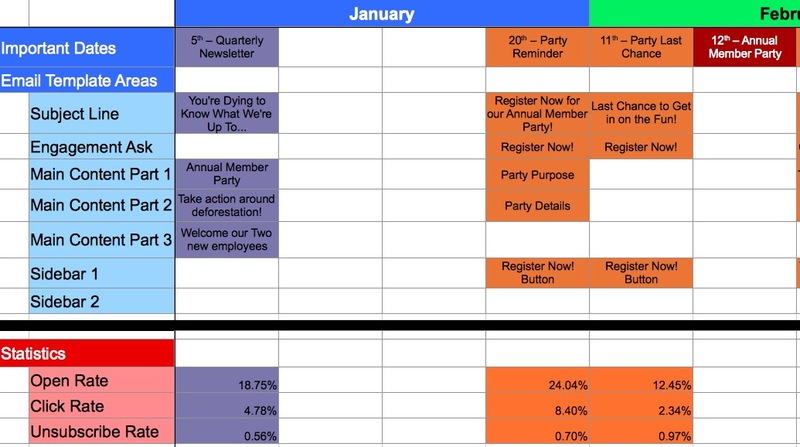 The idea here is that you can plan out your message placement in the actual email itself through the message calendar. 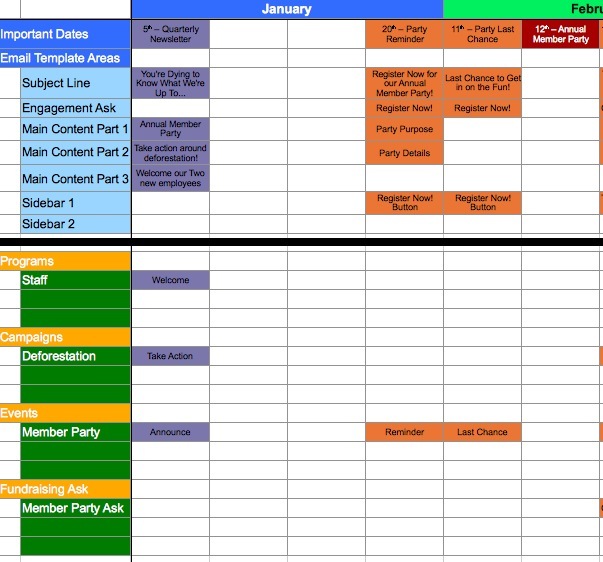 Whether your communications person is filling in all the rows or multiple people are contributing, the message calendar can act as the shared document to get multiple content pieces organized. For each email that I’m planning, I first find the week that I want to send it, then start filling in cells in that week’s column based on the content I want in each template area. Notice that I put the actual send date of the email in the “Important Dates” row. Hover over the image to see it filled in with example content (click for a larger version). If you’re reading this post in an RSS reader, you may have to click through to the actual site. The above example is a simple message calendar. I have email content assigned to weeks in January and areas inside the email. I can see when other emails are coming up and space them out accordingly. As a result, we can track our messaging across time. We can also add elements to help us keep track of other information with the message calendar (after all, it’s just a spreadsheet). One additional area we can add is a Program and Campaign section. This will help us keep track of which programs and campaigns the emails are updating our audience on. When an email mentions a specific program area or campaign we mark it in the Program and Campaign section. Hover over the image to see it filled in with example content (click for a larger version). Together, a message calendar tracking content in the email template as well as programs and campaigns might look like the example below. Notice that each email has areas marked in the Programs and Campaigns section to note what subjects that email covered. This way, we can always see how we are messaging around a specific program or campaign throughout the year by looking at that specific program’s message calendar row. Another addition that we can add is a Statistics section to track metrics surrounding our email campaigns over time. This way we can keep track of what email content is engaging our audience to open and click and what content is being ignored. In other words, we can start tracking our measurable communications goals and see if we’re actually succeeding. An alternative to this is to use a simple message calendar for calendaring out your email and, in conjunction, using a Publishing Matrix to coordinate that messaging with your other communications channels. Calendaring your messaging is a great way to get more organized about your organizational communications as well as be intentional about your appearance in people’s inboxes (no one likes spam.). Whether your goal is to improve the narrative arcs around your campaigns or keep track of messaging from multiple departments, having a document to keep track can save you frustration and time while allowing you to track progress to your goals. Looking at time as a line like in our message calendar template (vs. in a traditional calendar) allows you to track individual programs, multiple messaging arcs and statistics much easier. 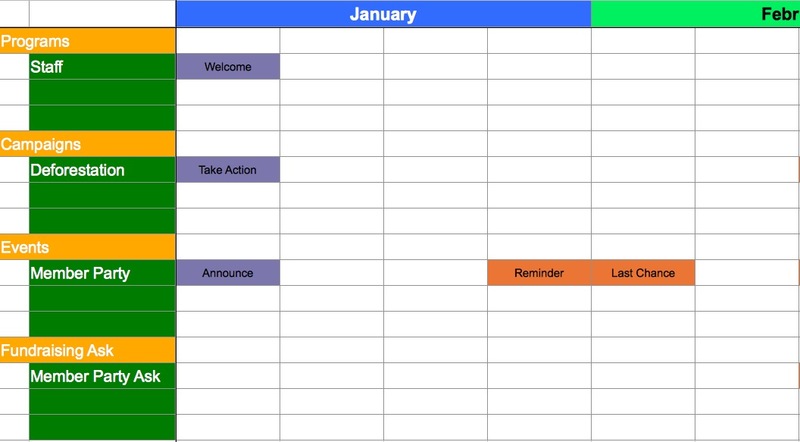 If you’re thinking that you might try out our message calendar template, you can download it here (XLS file). Does this template seem like something that would be useful for your work? What would you change? How do you calendar your messaging? « Are Your Emails Skim? Or 2%?